As an experienced project manager, I am sure you are familiar with all 10 terms described down below. But if you are just starting out as project manager, then you may or may not be familiar with them. If you have gone to school to learn project management, then I am sure you understand them. Otherwise, this post may be the best article you have come across to learn about these terms on one page. I like to mention one simple principle and that is to not bogged down with these terms and charts especially when it comes to using some kind of software. You might lose the big picture. 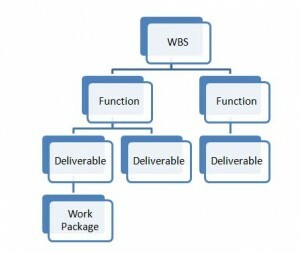 WBS stands for Work Breakdown Structure. The process is hierarchical. 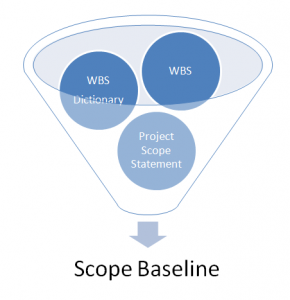 WBS keeps breaking different components down to the lowest level to show all the work that produces deliverable and in essence is the total scope of the project. I used to work in software and I used Nassi Schneiderman charts in many projects. It creates a similar structure. You keep creating charts from top down till you get to the very bottom so you can’t go below any further. When you break down the project in smaller modules, have a milestone to each of the module for finishing it. If you are using milestone software, then sometimes you’ll see them marked as a black diamond. Once you hit a milestone on time and complete the part, that’s a great cause for celebration. Take your team members out for pizza. 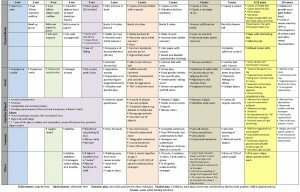 As you can see from the details of the project milestone chart, you might lose the big picture. Try not to. The finished project is either a success or failure. However, if you have carefully broken it down in modules, it’ll turn out to be successful than failure. Before you start working on it, you should have created a baseline which is nothing but approving the project by the Change Control Board (CCB). Project plan also includes the project schedule. Resist any change suggested by the senior management especially marketing. For those changes or additions, create another phase that can have its own milestones, the scope, the budget and its own quality control. Go through the same gyration for each phase thereafter as you have for the first phase. Get each phase approved by CCB. The little twist about a triple constraint is there are four components of the triple constraint. It’s usually indicated by a triangle. 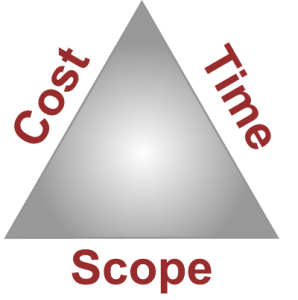 So it’s balancing the time, the cost, the scope, and the quality of your project. 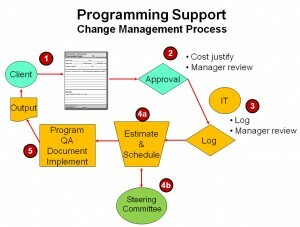 Some project managers would take the requested changes and implement them in one and only phase. It can create a moving target and you might not be able to finish it within budget and on time. However, doing it that way, the project seldom comes to an end. But if you divide it into phases, then it’ll be more manageable. I am personally all for different project phases. For each phase (the whole project may be just one phase), there is a project life cycle. This cycle consists of initiating processes which feeds the planning processes. Once your project begins executing, you must follow closely the executing processes, monitoring and controlling processes that begin to occur throughout the project. Once the project is completed, you enter the closing processes. 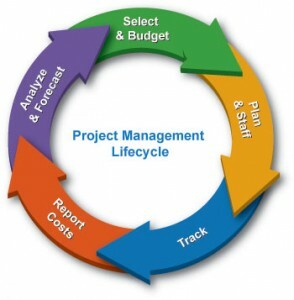 In essence, the project life cycle consists of initiating, planning, monitoring, controlling, executing. and closing the project. 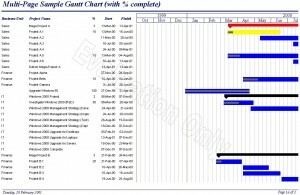 A Gantt chart is a graphical display of the schedule information. If you look at your work breakdown structure, it includes dates and durations for tasks to be completed or deliverable to be produced. It’s good to learn it but don’t spend too much time – 8 hours a day – on it. 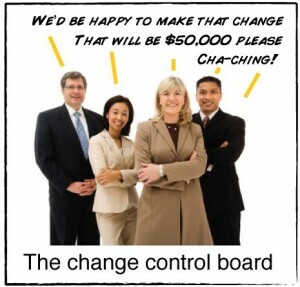 CCB stands for Change Control Board. It is a group of representatives for stakeholders. They are folks who review changes and can approve or deny them. One thing that can be beneficial to project manager is it takes the load off their shoulders and they’ll not be liable to any delay in the project. The CCB must take full responsibility for the changes it has approved. The stakeholders include customers, vendors and other departments in the organization. Whoever and however many they are, it’s important you have them in writing in the form of a list and propagate it throughout the concerned folks. It’s also important that folks on the list are actively involved. You should interact with them on a regular basis. They can be affected positively or negatively. It does not matter as long as you keep them involved. They are the ones who have a vested interest in the project. One of your tasks as project manager is to keep them included in your status report. As long as you give them a brief status on a regular basis, that’s all they might be interested in. Don’t get bogged down with the definition of managing change or change management. As a project manager, you are responsible for implementing the changes approved by the CCB. You are responsible to give the authority to your team members for each of their milestone. You are responsible to implement processes on who does what, when, and where related to the changes on the project. One of the most important tasks for you is to control the scope versus managing change. A project is initiated and executed. It’s going to infiltrate different organizations or groups of the corporation. Your job is to make sure that changes are effectively implemented. These changes might trigger emotional behaviors of the stakeholders. Therefore, you always keep in front of you the changes approved or denied by the CCB so you can relate them to whomever has emotional connect or disconnect to them. Your job thus is to prevent any potential chaos that might be brewing because of the changes. Your company might have installed its own version of risk management. However, if it has international competitors, it should conform to the risk management defined by International Organization for Standardization, better known as ISO 31000:2009. 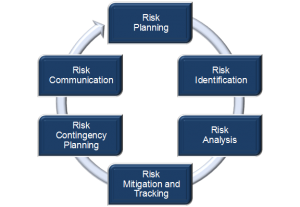 Hire someone to implement ISO 31000-2009 risk management processes. You’ll be better off hiring someone so you can attend to other matters as project manager. The beginning of the project is a good place to start identifying risks and continue doing so throughout the project until it successfully comes to an end. Along with risk management, you gotta have risk mitigation which is nothing more than risk response. It basically entails how best to respond to risks and attacks on the project. So along with risk management, you gotta have risk mitigation in place as well. All these terminologies and tools and utilities can be extremely beneficial to you as a project manager, but don’t get bogged down in the details. Otherwise, you might lose the big picture. It has happened to a lot of folks. And that could be one reason why some projects fail. To me, these are some of the top 10 terms to know and understand. All these tools are great but they should not overwhelm you in such a way that you lose the big picture. As long as you continually have the big picture in front of you, then these terms and the charts will help you a lot in your project management endeavor.